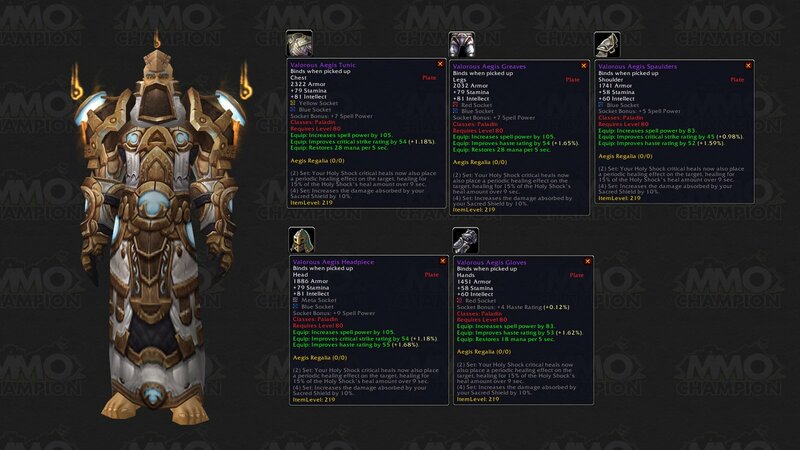 MMO-Champion has just posted information on the Tier 8 gear in the recent PTR patch (build 9704). First, let me say that the set does look better with a kilt than with pants, but I’m still pretty sad about the way this armor set turned out (compared with the awesomeness of the concept art, especially). This is one helm I won’t be showing, for fear of feeling like Thomas the Tank Engine. Secondly, I’m disappointed: the Helm and Chest of the 25-man set are available on the Emblems of Conquest quartermaster, for 48 Emblems of Conquest each. However, logically the Emblems of Valor vendor should have two pieces of the 10-man set for Emblems of Valor, and they… don’t. Which makes it tough for people in 10-man teams who have poor luck with the RNG, or who pug and don’t get to rely on getting an equal shot at loot. I hope Blizzard will put the items on there. That said, now let’s look at the stats. Net effect of upgrading all 5 pieces: +54 Stam, +54 Int, +39 mp5, +327 Armor, -31 Crit, +23 Haste, +90 Spellpower, plus a change in gemming (if you socket for color). Net effect of upgrading all 5 pieces: +46 Stam, +41 Int, +39 mp5, +203 Armor, -45 Crit, +46 Haste, +72 Spellpower, plus a change in gemming (if you socket for color). It’s interesting to note that both armor sets nearly double their mp5 at the expense of Crit, and that the socket colors are an attempt to push people to socket more mp5 gems. I’ve never been more thankful to be a jewelcrafter, with my prismatic gems. Paladin T8 Holy 2P Bonus — Your Holy Shock critical heals now also place a periodic healing effect on the target, healing for 15% of the Holy Shock’s heal amount over 9 sec. Paladin T8 Holy 4P Bonus — Increases the damage absorbed by your Sacred Shield by 10%. The 2P bonus sounds nice, but at 2k spellpower a crit Holy Shock lands for an average of ~6200, which means the HoT component only does 930 healing over a further 9 seconds, which is virtually insignificant. The 4P bonus again sounds nice; at 2k spellpower your Sacred Shield will absorb 2200 damage instead of 2000 damage. (Sacred Shield absorbs 500 + 0.75*Spellpower.) Given that each Sacred Shield iteration will absorb that much, and it’ll trigger up to five times for one cast of the spell, this means you’re potentially gaining about 1000 damage absorption. However, to be honest, both of these feel pretty underwhelming next to the Tier 7 set bonuses: 2pT7 is +10% crit to Holy Shock, 4pT7 is -5% cost to Holy Light. Unless I’m missing something, the T8 bonuses just aren’t in the same league. Paladin T8 Holy Relic — Increases spell power of Holy Light by 160. This is available for 25 Emblems of Valor, on the EoV quartermaster in Dalaran. However, I don’t think it’s superior to the Libram of Renewalfor 40 Emblems of Heroism – especially not given that Ulduar is meant to be a more mana-stringent raid. Still, if you’ve got spare EoVs lying around, it could well be useful for fast-furious-spam-frenzy fights where mana conservation isn’t an issue. Some information has started to trickle out from Blizzard about the way loot will work in the next tier of raid content. Some of it’s what I expected, some of it surprises me. Here’s some of what we know, now. There will be a new Emblem type: the Emblem of Conquest. You will be able to spend Emblems of Conquest on Deadly Gladiator gear in the same way you can spend Emblems of Valor on Hateful Gladiator Gear right now. There will be a new boss in a new wing of the Vault of Archavon, who will be able to drop some, but not all, of the new top-tier PvP items (Furious Gladiator gear), random Honor items, and any of the T8 PvE set items. PvE gear progression is basically this: Naxx 10 < Naxx 25 = Ulduar 10 <Ulduar 25. Ulduar-10 will have gear roughly equivalent to Naxx 25 in quality; you gear up for Ulduar-10 in Naxx-10. Ulduar-25 will have gear that’s a step up from the iLvl 213 stuff from Naxx 25; you gear up for Ulduar-25 either in Naxx-25 or Ulduar-10. There’s no mention of a new 10-man Emblem type. The logical conclusion: Emblems of Heroism will continue to buy iLvl 200 stuff (equivalent to Heroic epics and T7.10), but there are no plans for new items at this level. Emblems of Valor will buy iLvl 213 stuff (T7.25 and T8.10). Emblems of Conquest will buy iLvl 226 stuff (T8.25). In other words: there’s no benefit to hoarding your Emblems of Heroism, because you won’t be able to buy any new items with them. (I’m spending them on Ret gear.) Emblems of Valor, however, are worth saving for the T8 10-man gear, in case there are some decent sidegrades there. This post refers to gear that drops in 25-man raids. If you’re looking for a list of gear to get ready for raiding, you might be more interested in my Pre-Raid Holy Paladin Gear List instead. This post aims to provide a nice ‘wishlist’ of holy pally gear to aim for. Let me say up front that if you think I’m wrong about a piece of gear, that’s fine; I know that balancing spellpower, crit, haste and intellect is a personal juggling act and nobody knows your playstyle better than you do. a) In my opinion, ideal paladin gear has intellect, crit, haste (within reason; excess haste is useless) and spellpower, and doesn’t waste item budget on less valuable stats like spirit or mp5. This obviously affects the selection of items I consider ‘best in slot’. b) I won’t be recommending anything lower than mail armor, and even then I won’t be recommending a lot of that. The debate about holy paladins wearing cloth and leather rages on, but for my part: I’m a plate elitist, and I make no bones about recommending plate to other paladins. So, on with the show. Faceguard of the Succumbed, from Thaddius (and occasionally Gluth). Faceguard of the Succumbed is the clear winner here, as it features a meta socket. The T7 helm has the meta socket, but unfortunately trades off the Faceguard’s 61 haste for an unappealing 20 mp5. The Helm of Diminished Pride from Maexxna/Gluth has huge crit and spellpower, but no meta socket and no haste, wasting its itemisation budget on mp5 instead. Life-Binder’s Locket, from the quest to kill Malygos in Heroic mode. Despite the mp5, the quest reward necks are excellent. Until you kill 25-man Malygos, however, the drop from Sapphiron is a very strong alternative. Elevated Lair Pauldrons, from Malygos. Epaulets of the Grieving Servant, from Faerlina (and occasionally Gluth). 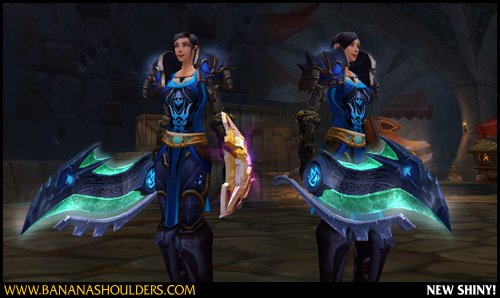 The Valorous Redemption Spaulders are marginally better than the other shoulders, partly because they’ve got a socket which makes them more flexible, and partly because they contribute towards getting the T7 set bonuses. The Elevated Lair Pauldrons are better than the Epaulets, as an iLevel 226 item, but they waste stats on mp5. They are an upgrade on spellpower compared with the other shoulders, but at this gearing level stacking spellpower is less valuable than stacking int, crit or haste. Pennant Cloak, from Sartharion with 2 or 3 drakes up. Shroud of Luminosity, from Grobbulus, Gothik, Heigan and Maexxna. The Pennant Cloak is far and away the strongest cloak for holy paladins currently in-game, and it’s likely to be hotly contested by other casters as well. In comparison, the Shroud is very accessible, and still a very good piece of kit. Chestplate of the Great Aspects, from Sartharion. The Chestplate of the Great Aspects is ahead on every useful stat except Intellect. The T7 chest does have two sockets to the Chestplate’s one, adding greater flexibility, but it just doesn’t hold up. Bands of Mutual Respect, from Instructor Razuvious (and occasionally Gluth). Bracers of Liberation, from Grobbulus (and occasionally Gluth). The Bands, despite being mail, are significantly better than the next-best Bracers, largely thanks to their gem slot. The Abetment Bracers from Gothik/Gluth also have a socket, but they waste itemization budget on mp5 so are generally inferior to both bracers listed here. The T7 gloves are best in slot here; they beat the Rescinding Grips partly thanks to the gem slot that makes them more flexible, and partly due to their contribution towards the set bonuses. The Rescinding Grips are good alternatives until you get the Tier token, though. Waistguard of Divine Grace, from Patchwerk (and occasionally Gluth). Girdle of Recuperation, from Razuvious (and occasionally Gluth). These two items are all but identical, with interchangeable crit and haste ratings. Pick the one featuring the stat you’re stacking. Leggings of Voracious Shadows, from Gluth. Again, the T7 legs are best in slot; they have marginally more of all the appealing stats, better socket colors, and they’re part of the Tier set. What’s not to love? And best of all, you can buy them with Emblems if the RNG hates you. Poignant Sabatons, from Noth the Plaguebringer (and occasionally Gluth). Really, there’s no competition for these at all, and they’re BoE so you can look for them on your AH. Signet of Manifested Pain, from Kel’Thuzad. Seized Beauty, from Anub’Rekhan, Patchwerk, Faerlina, Noth and Razuvious. Band of Channeled Magic, bought with 25 Emblems of Valor. Titanium Spellshock Ring, crafted by Jewelcrafters. The Signet from Kel’thuzad is literally the only 25-man ring with all the stats you want and none of the ones you don’t; Seized Beauty is next-best, although the mp5 instead of Haste is something of a waste. The other two rings are reasonable substitutes, although I wouldn’t spend emblems on the purchased ring if you have regular access to Kel’Thuzad. Illustration of the Dragon Soul, from Sartharion. Soul of the Dead, from Sapphiron. Forethought Talisman, from Maexxna, Heigan, Gothik, and Grobbulus. Darkmoon Card: Greatness, from the Darkmoon Nobles Deck. Je’Tze’s Bell, BoE world drop. Embrace of the Spider, from 10-man Maexxna and Gluth. Trinket selection is a tricky business, as they all have different effects. To be honest, this is one area where I haven’t done enough research to feel comfortable saying that X is better than Y. Input welcome, and I’ll update the post with more guidelines. Speaking personally, I’m after Illustration of the Dragon Soul and Soul of the Dead. The Turning Tide, from Kel’Thuzad. Hammer of the Astral Plane, from 10-man Kel’Thuzad. Life and Death, from Gothik and Gluth. The Turning Tide is an amazingly good holy paladin weapon; unfortunately, it’s also amazingly good for mages and warlocks, and you’ll have to beat them off with a stick. In the meantime, the other two weapons are both solid all-rounders with a healthy amount of each desirable attribute. Voice of Reason, from Kel’Thuzad. Aegis of Damnation, from 10-man Maexxna and Gluth. Obviously, Voice of Reason is the stand-out winner here. Libram of Renewal, bought with 15 Emblems of Heroism. Libram of Tolerance, from Patchwerk and Gluth. Libram use tends to be very situational, but the 10-man Libram of Renewal is a more generally useful choice than the 25-man, except in rare situations where you need high throughput more than mana conservation. 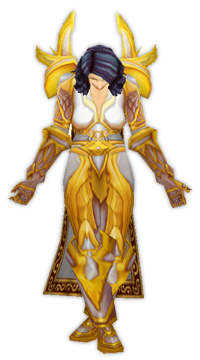 I’m assuming here that you’re going to want the four-piece Tier 7 set bonus from your Redemption Regalia, since Holy Light is such an integral part of how we heal in WotLK. The Tier 7 pieces are already best in slot for shoulders, gloves and legs, which means you have to use either the helm or the chest to get your socket bonus. Looking at what you’re giving up (and for comparison’s sake I’ll assume in all cases you’re socketing items with +16 Int yellow gems). Net effect is +5 Int, +20 mp5, +9 Crit Rating, -61 Haste Rating. Net effect is +21 Int, +20 mp5, -27 Crit Rating, -19 Haste Rating, -24 Spell Power. It’s your choice as to which sacrifice you prefer to make. Last year, I wrote about the usefulness of the festival dumplings compared with conjured manna biscuits. Let’s look at it again compared with the level 80 Conjured Mana Strudel. It restores 15000 health and 12960 mana over 30 seconds, whereas the Festival Dumplings restore 4% of your health and 3% of your mana per second for 25 seconds, for a total of 100% of your health and 75% of your mana. So: if your health is more than 15000, or your mana is more than 17820, the festival dumplings will return more health or mana than the strudel – and it will do it five seconds faster, too! 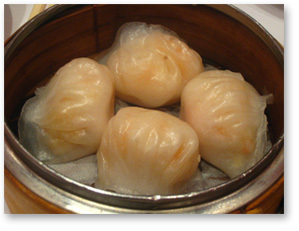 Since everyone’s going to be flush with coins of ancestry after visiting all those elders for the achievements, if you’re not a tailor or engineer you may as well buy some tasty, tasty dumplings! I don’t generally make “yay I got this loot last night!” posts, but I can’t help but post about this because I’m so darn happy about it. Throughout TBC, I was one of my guild’s worst-geared healers, because my dice hate me. I wasn’t lagging to the point of ridiculousness, but I was always one of the last to get an upgrade. Thankfully, in WotLK, things seem to be somewhat different. Last night Gluth dropped Life and Death, and I expected there to be fierce competition for it. I pulled out a mighty roll of 98, and faced absolutely zero competition anyway as everyone was hoping to roll on the tier tokens instead. As a bonus, it looks freaking awesome. 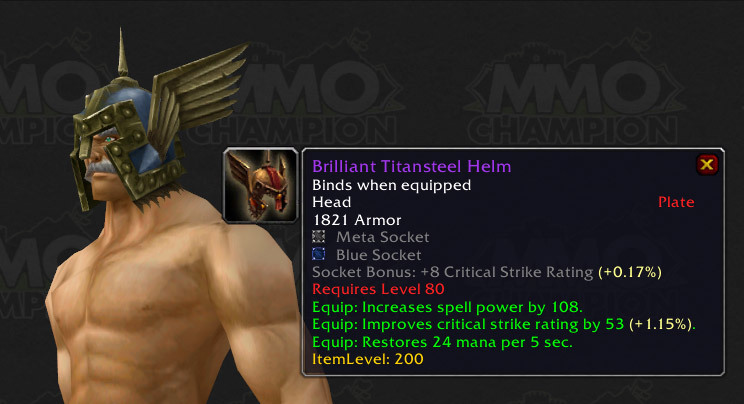 The best change, in my opinion: the Brilliant Titansteel Helm is being beefed up. Old version: 46 crit, 24 mp5, 108 spellpower. New version: 53 crit, 24 mp5, 108 spellpower, meta socket, blue socket, +8 crit socket bonus. I might actually go back to wearing mine. The Titansteel Guardian is being nerfed; its spellpower is being reduced from 490 to 457. Other stats are unchanged. It’s still an excellent mace, and worth getting if you can’t get your hands on something better, but it’s now a less competitive alternative if you do have the War Mace of Unrequited Love from Heroic Keristrasza. Je’Tze’s Bell is becoming BoE. That’s a damn nice trinket, although I suspect prices are going to be sky-high. Time for the next installment in my series of ‘How To Gear Your Paladin In WotLLK’ posts: Holy Paladin Gem Choices. This is an issue that’s been somewhat complexified by the mountain of new gem cuts in WotLK. Updated 1 Feb 09 to include the Reckless orange cut and adjust recipes based on 3.0.8. Do not use TBC-era gems! No, not even epic gems. Even uncommon-quality WotLK gems are better than the very epic-est of TBC gems. Compare, say, Runed Bloodstone and Runed Crimson Spinel if you don’t believe me. Now that that’s out of the way, let’s move on to look at each type of gem in a little more detail. I’ll list the gems of each color that are appropriate for paladin healers, and then we’ll look at the pros and cons of each gem. Mathematical advantage. Some stats are just stronger than others for holy paladins, because of the nature of our game mechanics. See this post for a discussion of why gearing (and gemming and enchanting) for Intellect is better than mp5, for example. The stats you need for the content you’re doing. Mechanical advantage aside, nobody knows your gear better than you. If you need more healing output, gem for spellpower. If you’re PvPing, gem for crit and haste, for mobility. If you’re running out of mana, gem for Int/mp5/Crit. Socket bonuses. As I’ve said before, many people get tunnel vision, and pick gems based on socket color regardless of how good the socket bonus is. Others ignore the socket bonus and gem for one stat with no exceptions. Neither choice is necessarily the wisest. A piece of gear with two blue sockets and a 3 mp5 socket bonus? I’d ignore that, and stick two red spellpower gems into it. A piece of gear with a red and a yellow socket, and a 5 spellpower socket bonus? That’s probably worth sticking to. Meta gems. All other considerations aside, sometimes you have to socket a slightly sub-optimal gem for the sake of activating your meta gem. Now you know the factors involved, let’s look at what to socket where. Runed Scarlet Ruby, no question. You’re really choosing between 9 Spellpower (Royal Twilight Opal), 8 Intellect (Dazzling Forest Emerald), 8 Haste Rating (Energized Forest Emerald) or 8 Crit Rating (Sundered Forest Emerald). All other factors being equal, I’d go for the Royal Twilight Opal again. Yellow has better choices than blue; none of these gems are really bad to socket, and depending on the kind of content you’re doing and the role you’re playing in your team, they often make for a more well-rounded gear set than pure spellpower gems anyway. Avoid any of the green gems for this socket, and look at yellow and orange gems. Pretty much any of the orange or yellow gems I listed above are acceptable, in fact â€“ although make sure you’re not needlessly piling on auxiliary stats like Haste at the expense of your mana pool or crit rating. Int and Crit are both multi-purpose, improving throughput and mana longevity; by comparison, Haste only improves throughput. My personal preference is the Luminous Monarch Topaz or Potent Monarch Topaz for the balance of stats they provide. The Reckless Monarch Topaz is also acceptable if you’re trying to build up your Haste rating, but I generally feel that there’s more than enough Haste directly on gear and you’re better off gemming for Int or Crit. Of the options I listed, the Insightful Earthsiege Diamond is the strongest choice; +Int has come into its own as a stat for paladins, and the proc is very powerful: +600 mana, 5% proc rate, possibly with an internal cooldown of 15 seconds. Elitist Jerks has a comparison of meta gems in this thread and the IED comes out far ahead. The next best choice is the Ember Skyflare Diamond. Really crit-stacked healadins may also like the Revitalizing Skyflare Diamond but it’s still probably not strong enough to compete with the IED. Also note that there are a few PvP-oriented meta gems that may prove very useful in specific content, such as those with reduced Fear/Silence/Stun duration, or improved run speed. You can see a complete list of jewelcrafter-cut WotLK meta gems with this WoWhead filter. Okay, gear lists are always useful, and as more and more people are starting to hit the 78-80 range, it’s time to think about what you’re going to wear to your first Naxxramas raid. Remember, no-one likes being underdressed! The following are some suggestions for each item slot; I’ll suggest the best items from various sources, so no matter your playstyle you can take a shot at gearing up. Note that this covers gear that does not involve raiding, arenas or battlegrounds. The level 70 Badges of Justice have been replaced by two types of Level 80 tokens. Emblems of Heroism drop in Heroic 5-mans, and 10-man raids, and can be used to buy iLvl 200 epics (the equivalent of 10-man Naxxramas drops). Emblems of Valor drop in 25-man raids, and can be used to buy iLvl 213 items. In this guide I’ve only referenced items purchasable with Emblems of Heroism, as Emblems of Valor aren’t accessible outside of 25-man raids. This list is aimed at holy-spec paladins; therefore, Crit is valued highly because it’s our primary regen stat (along with Intellect, now). If you’re a protection or retribution paladin building an offspec set, you’ll want to avoid the crit-heavy items because they do nothing to help your mana, and look for mp5 (and, more importantly, Intellect) as a regen stat. There are a few item changes in Patch 3.0.8 that will affect some of these items (specifically, a helm, a weapon and a trinket). Check out this post for more details. Crown of Forgotten Kings from the last boss (Ymiron) in Normal or Heroic Utgarde Pinnacle, or Platehelm of Irate Revenge from the quest to kill Ymiron are both okay in the meantime. Best option: Ferocious Pauldrons of the Rhino from the second boss (Gortok Palehoof) in Heroic Utgarde Pinnacle. 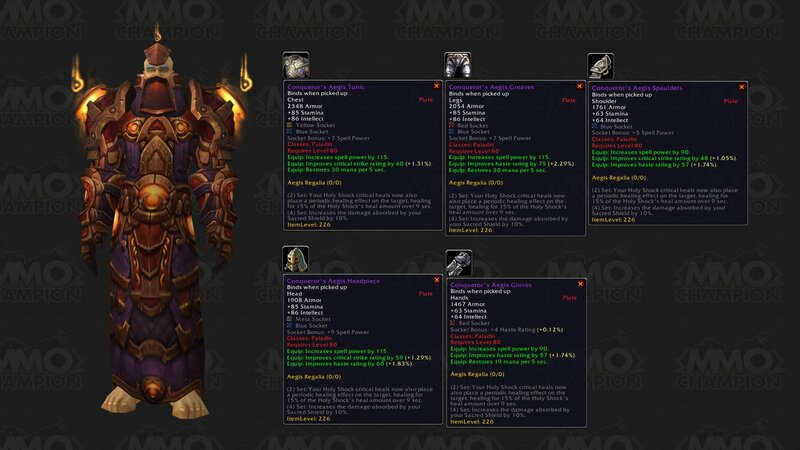 Alternatives: Pauldrons of Destiny from the last boss (Mal’ganis) in Heroic CoT:Stratholme, or Discarded Silver Hand Spaulders from the same boss in Normal mode. Failing any of the above, which are either hard to get (the Ferocious Pauldrons) or inferior (the mp5-laden CoT drops), Pauldrons of Morbidus are a really good slot-filler, with a good balance of stats. They’re from The Flesh Giant Champion, the conclusion of a quest chain in Icecrown. WoWhead is not entirely helpful on that quest chain, so your best bet is just to go to Darkrider Arly and do all the quests she and her paladin companion offer; the chain will lead you to this quest. Best option: Wispcloak: BoE craftable by tailors. This is leagues ahead of the next alternative, and if you only have one epic crafted this should be it. Note for the really keen: you can buy the 10-man Tier 7 chest with 80 Emblems of Heroism. However, that’s still raid gear, and you’ll need something to wear while you’re racking up those 80 badges, so I’m not counting it in the list for now. Alternatives: Catalytic Bands from the third boss (Mage-Lord Urom) in Heroic Oculus, or Bracers of Accorded Courtesy from Revered with the Wyrmrest Accord. Like the chest, you can buy the 10-man Tier 7 gloves with 60 Emblems of Heroism. Best option: Grips of Sculptured Icicles: a zone-wide drop in Heroic Nexus. Best option: Magroth’s Meditative Cincture: costs 40 Emblems of Heroism. Ionar’s Girdle from the third boss (Ionar) in Halls of Lightning, or Girdle of Eternal Memory from an Argent Crusade quest chain in Icecrown, are both acceptable stopgaps until you get a better belt. Best option: Leggings of Protective Auras from the final boss (Ley-Guardian Eregos) in Heroic Oculus. As slot-fillers, there are two excellent rep items: Standard Issue Legguards from Honored with Argent Crusade, or Discarded Titanium Legplates from Revered with the Puppy-men – er, I mean Frenzyheart. Finally, if you’re really stuck with terrible legs in the meantime, there’s a green quest reward you might like: Bjornrittar’s Chilled Legguards, from a Storm Peaks quest. Other decent choices include Harpooner’s Striders from the third boss (Skadi) in Utgarde Pinnacle, Skywall Striders from the third boss (Ionar) in Heroic Halls of Lightning); in the meantime, Slippers of the Mojo Dojo are a good starting point. Lots of choices here, because you need two rings and they’re all Unique-Equipped. Best choices: Titanium Spellshock Ring: BoE craftable by Jewelcrafters and Signet of Hopeful Light from Exalted with Argent Crusade. (The Spellshock ring is probably the best healadin ring outside of 25-mans, and the Signet is very nearly as good. There are a lot of other good choices if the above aren’t available: Band of Enchanted Growth from Urom in Heroic Oculus, Ring of the Traitor King from Anub’arak in Heroic Azjol-Nerub, Globule Signet from Ichoron in Heroic Violet Hold, Solitaire of Reflecting Beams from Moragg in Heroic Violet Hold, and Ring of the Frenzied Wolvar from Gortok in Heroic Utgarde Pinnacle. Best options for questable rings are Newt-Eye Ring from an Icecrown group quest and Kurzel’s Angst from a quest in Drak’Tharon Keep, although both of these are weaker than the heroic drops. Je’Tze’s Bell, BoP world drop (mostly off elite mobs). Apparently should be fixed soon to be BoE, but I haven’t seen a confirmed source on that. An excellent trinket if you’re lucky enough to get one. The proc works out as approximately 25 mp5. Darkmoon Card: Illusion, from the Darkmoon Prisms deck. Although the mana regen is on a 5 minute CD, it’s a welcome addition now potions are limited to one per fight. Across a 5 minute cooldown, it’s an equivalent of 20 mp5 (although it’s relatively more valuable in short fights). Darkmoon Card: Greatness, from the Darkmoon Nobles deck. There’s a +Int version of this card (and a +Spi version as well) although Wowhead only shows the +Agi and +Str versions so far. With Divine Intellect, a +Int version would deliver 103 Int, with 345 Int on a proc (which is a 35% proc chance, probably with a 45 second internal cooldown). That’s a pretty huge boost, and if you synchronise the proc with Divine Plea, that’s a phenomenal amount of mana return. I’d go out on a limb and say this has the potential to be the single best trinket for pally mana (and the extra spell crit from the +Int is a nice bonus, too). The Egg of Mortal Essence, purchasable with 40 Emblems of Heroism. A good, solid, easily-accessible trinket which will last you a good long time. A pure throughput trinket, with little support for mana issues. Forge Ember from Sjonnir in Heroic Halls of Stone. An excellent trinket, doing dual-duty for throughput and regen thanks to the crit and the proc effect. Spark of Life from Sjonnir in Heroic Halls of Stone. Less impressive than Sjonnir’s other trinket drop, this is still decent, particularly if you’re low on +haste. Figurine – Sapphire Owl, BoP crafted by Jewelcrafters. While weak on the throughput side, this has the potential – especially socketed with Int gems – to be an excellent regen trinket. Notably, it provides a hit of mana independent of potions, dark runes, Divine Plea or similar regen cooldowns. Mercurial Alchemist Stone, BoP crafted by Alchemists. A solid trinket, particularly with Wrath’s new limitations on potion use. This makes every potion that much more valuable, and has some nice equip bonuses to boot. Tears of Bitter Anguish, a BoE drop from Nascent Valkyr in the Storm Peaks. A good throughput trinket, especially useful for fights with high mobility needs, although you probably only want to equip something like this in place of a +spellpower trinket once the rest of your gear passes muster. – this is being changed to work on melee crits only in 3.0.8. Soul Preserver, from Mal’ganis in CoT:Stratholme. The equip bonus is nice, but the proc is underwhelming; it’s only a 2% proc chance, which comes into its own with multi-target healers. For paladins, it’s probably not the best choice for the slot unless you’re really lacking in trinkets. Tome of Arcane Phenomena, from Eregos in The Oculus. Another starter trinket, better than the stacks of green quest reward trinkets you’re probably drowning in, but to be replaced as soon as possible. Cannoneer’s Fuselighter from an early Icecrown quest. It’s got a good combination of stats, just not enough of them, but it’s the best of the pre-iLevel 200 trinkets. Alternatives: Gavel of the Brewing Storm from Revered reputation with the Wyrmrest Accord, or Gavel of the Fleshcrafter: drops from the second boss (Salramm) in Heroic CoT:Stratholme. There are other options, of course: the Beguiling Scepter from the last boss (Mal’ganis) in CoT:Stratholme, Jeweled Coronation Sword from the last boss (Ymiron) in Utgarde Pinnacle, or Totemic Purification Rod from Revered with the Kalu’ak; these are all good if you’re still waiting on Wyrmrest rep and can’t get the drops you want. In the Meantime: Saronite Spellblade, BoE craftable by Blacksmiths – a great starter weapon while you wait to get one of the better options listed above. Tharon’ja’s Aegis from the last boss (The Prophet Tharon’ja) in Drak’tharon Keep is a reasonable stopgap, although inferior to all of the above. In the Meantime: Saronite Protector: BoE craftable by Blacksmiths – a great starter shield which served me until level 80. Libram choice is very dependent on your healing style; your typical rotation and spell choices are going to dictate what you find more useful, generally. Best choice: Libram of Renewal, for 15 Emblems of Heroism. Unfortunately both of these require PvPing, costing both Honor points and Arena points, but there are no other Flash of Light-centric Librams in WotLK. This post grew out of an answer I wrote for someone on the PlusHeal forums; I figured other people might find it useful too. By the time you hit 80 and do a couple of instances, you’ll likely have upgraded a lot of your gear, if not all of it – only a few pieces of BT and Sunwell gear are better than the iLevel 187-200 blues you’ll find in level 80 instances and heroics and on the rep vendors. One of the easiest ways to wring some extra oomph out of your gear is to make sure it’s fully enchanted – sure, don’t enchant something you pick up at level 73 that you know will be gone by level 77, but once you start picking up stuff in the endgame you really owe it to yourself – and the people you play with – to maximise your gear. The good news is that right now is a cheap time to get your gear enchanted; crafters and enchanters are often willing to do things for very low fees or even provide some of the materials, because they’re scavenging for skill-ups! So, without further ado, here are the holy-pally-relevant item enhancements that have been introduced in Wrath, along with a bit of commentary and analysis of the choices. You’ll note that for some slots there are various degrees of enchants for the same stat. In Wrath, many enchants have a basic version with very reasonable mats, and a top-of-the-line version with absolutely hideous mats. Spellpower to weapon is a good example: +50 Spellpower only requires 10 Infinite Dust and 2 Greater Cosmic Essences; +63 Spellpower requires 40 Infinite Dust, 20 Greater Cosmic Essences and 6 Abyss Crystals. Clearly, you’re best off saving the top-of-the-line enchants for gear that won’t be replaced for a long time, and use the cheaper equivalents on blues and early epics. Arcanum of Blissful Mending: +30 Spellpower/+8 mp5 – Revered with Wyrmrest Accord. Arcanum of Burning Mysteries: +30 Spellpower/+20 Crit Rating – Revered with Kirin Tor. Your choice here; I tend to prefer Crit over mp5, so that’s what I’d pick. Greater Inscription of the Crag: +24 Spellpower/+6 mp5 – Exalted with Sons of Hodir. Master’s Inscription of the Crag: +61 Spellpower/+6 mp5 – Scribe only. Lesser Inscription of the Storm: +18 Spellpower/+10 Crit Rating – Honored with Sons of Hodir. Greater Inscription of the Storm: +24 Spellpower/+15 Crit Rating mp5 – Exalted with Sons of Hodir. Master’s Inscription of the Storm: +61 Spellpower/+15 Crit Rating – Scribe only. Again, your choice here depending on whether you prefer Crit or mp5. Enchant Cloak – Wisdom: -Threat, +10 Spirit. Enchant Cloak – Greater Speed: +23 Haste Rating. Darkglow Embroidery: Chance to restore 300 mana on spellcast – Tailor only. Lightweave Embroidery: Chance to cause additional 1000-1200 Holy damage when you damage an enemy with a spell – Tailor only. Greater Speed is the obvious winner here. Darkglow Embroidery is a reasonable alternative (according to WoWhead it’s got a 35% proc rate with a 75s internal cooldown) if you’re one of the rare paladins who took tailoring. (Damn clothadins!) If you’re having a problem with aggro on specific fights, just get a secondary cloak with Wisdom on it for those fights only. 10 Int is worth about 4 mp5, a tiny amount of Spell Crit, 150 mana and 2 spellpower. Your call as to whether that’s better than 8 mp5; numerically it’s about on par. I’d be inclined to go for Powerful Stats, simply because not only do you get the benefits of 10 int, but you get all the other stats as well. However, if you’re low on mp5 and feeling the pinch (or you can’t afford the significantly higher cost of the Powerful Stats enchant) Greater Mana Restore is a perfectly reasonable choice. Fur Lining – Spellpower: +67 Spellpower – Leatherworking only. Socket Bracer: Add a socket – Blacksmith only. Stacks with enchants. The stand-out winner here is the +23/+30 Spellpower (or the Fur Lining for leatherworkers). +16 Int is nice enough for early gear, and very cheap on mats, but is nowhere near good enough to compete with the spellpower enchants. Note that unlike all the other crafter-only item enhancements, the blacksmith’s bonus socket is in addition to a regular enchant. Blacksmiths have no excuse for not making use of this. Hyperspeed Accelerators: +340 Haste for 8 seconds, 2 min cooldown – Engineer only. Socket Gloves: Add a socket – Blacksmith only. Stacks with enchants. Given the relative size of the enchants, the Spellpower enchant is vastly better than the Blasting enchant; it’s the only choice here. (And it’s way cheaper on mats, to boot.) For engineers, the Haste tinker apparently works out around a static 24 Haste Rating, which is okay if you’re scrounging for speed, but Spellpower is still way better. And, as with the Bracers, Blacksmiths should absolutely be socketing their gloves at all times. There’s no reason not to. Eternal Belt Buckle: Adds a colorless socket to the belt. These are BoE and craftable by blacksmiths for anyone’s use. There’s no reason not to use them, so do it. A free gem? Yes please! Azure Spellthread: +35 Spellpower/+20 Stamina. Sapphire Spellthread: +50 Spellpower/+30 Stamina. Master’s Spellthread: +50 Spellpower/+30 Stamina – Tailor-only. Shining Spellthread: +35 Spellpower/+12 Spirit. Sanctified Spellthread: +50 Spellpower/+20 Spirit – Tailor only. Much of a muchness here. As a general rule Spirit is all but useless for paladins, so the Stamina threads are better; however, if you regularly get innervates or have much better access to the mats, the Spirit threads are okay. Enchant Boots – Greater Vitality: +6 mana and health per 5. Enchant Boots – Icewalker: +12 Crit Rating/+12 Hit Rating. Both have their upsides; now that Judgements are important to Holy paladins for Judgements of the Pure (and Heart of the Crusader, for the newly-popular critadin builds with 18-20 points in Ret), Hit Rating is not entirely a waste of time. I’d probably go for Icewalker myself, but either is acceptable. Enchant Ring – Greater Spellpower: +19 Spellpower – Enchanter only. if you’re an enchanter, do this; if not, your rings go unenchanted. Enchant Weapon – Accuracy: +25 Crit Rating/+25 Hit Rating. Enchant Weapon – Mighty Spellpower: +63 Spellpower. Enchant Weapon – Exceptional Spirit: +45 Spirit. Enchant Weapon – Exceptional Spellpower: +50 Spellpower. The +Spellpower enchants are the obvious choices here; the Crit and Hit of Accuracy are nice (see the ‘Boots’ section for Spell Hit discussion), but 50-63 Spellpower is an order of magnitude more powerful. I list the Spirit enchant here solely because you may wish to carry a +Spirit weapon and offhand to be swapped in when you get innervated (for instance, after a battle rez). If you don’t get innervates, don’t bother – and, obviously, don’t take the +Spirit gear out of the hands of druids and priests who can make better use of it. Enchant Shield – Greater Intellect: +25 Int. Get Your Seal Whey Here! It's, Uh, Lovely! A quick tip for mana users: in advance of Wrath of the Lich King, you can buy the next rank of “water” already. Except it’s not water, it’s pungent seal whey. Yummy. Still, it’ll restore your mana faster than any water’s done before – presumably because you toss it back so fast it can’t hit your tastebuds. You can buy this charming beverage from the Inn in Ironforge – I haven’t found any other non-Northrend sources of it yet. I imagine there’s a Horde vendor that sells it too – if you’re a Hordie, please post and let me know so I can update the post! Go ye forth and enjoy your seal whey, folks. Just ignore the smell.